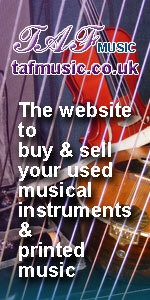 Thank you for visiting the TAF Music Gifts on-line shop. If you need to get in touch, you may use the contact form below, telephone us on 01544 231336 or by post at 24 Crooked Well, Kington, Herefordshire, HR5 3AF. To assist us in answering your query, please give as much detail as possible. We aim to respond to all genuine requests made through this page as quickly as possible. 1st, 2nd and 6th digits of the number below in the box provided. This message will be forwarded to TAF Music Gifts for follow up. TAF Music Gifts will not use your details for any purpose except to directly deal with your comments.